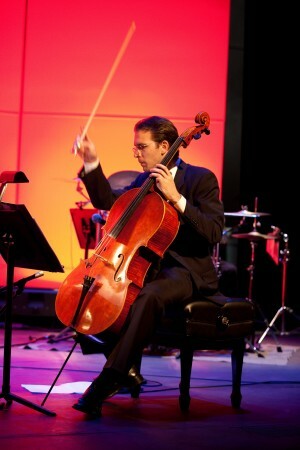 Gal Faganel is an acclaimed cello performer, teacher, coach, and recording artist. He has been praised in the press for his “exceptionally sensitive interpretation” (Slovenec – Slovenia), his “powerful and beautiful tone” (Dornse Krant – Netherlands), and his “brilliant virtuosity and youthful vigor” (Primorske Novice – Slovenia). As a performer, Faganel is frequently heard in recital, in chamber music concerts, and as a soloist with orchestra throughout North America and Europe. He is the founder and artistic director of the Arizona Chamber Orchestra, a conductor-less ensemble founded in 2009.Until 2010 he served as the acting principal cellist of the Phoenix Symphony. As a member of the Tetraktys String Quartet, he toured in the United States and Europe. He has also performed extensively with various other chamber ensembles, particularly his favorite—string trio. Faganel is currently an assistant professor at the University of Northern Colorado (UNC) in Greeley, where he greatly enjoys teaching cello and coaching chamber music. Prior to his appointment at UNC, he taught at Scottsdale Community College (AZ) and the University of Southern California. He regularly conducts master classes and teaches at summer music programs in the United States and Europe. At UNC, Faganel has received several grants for travel, research, and performances in four continents. Innovative teaching approaches utilizing video conferencing technology allow Faganel to be accessible to students worldwide. At age 13, Faganel won his first competition; he received first prize in the international competition Alpe Adria "Alfredo Marcosig" in Italy at age 15. In addition to winning three other international competitions, including the International Cello Competition “Antonio Janigro” in Croatia, he won the American String Teacher’s Association Competition in California and the Slovenian National Competition as a soloist and with piano trio. In 1997 he was named “Young Musician of the Year“ in Slovenia. The following year he won a national competition to represent Slovenia at the European Broadcasting Union - Eurovision Competition in Lisbon, Portugal. In 2006, Faganel began researching, cataloging, performing, and recording music for cello by Slovenian composers. He has completed two of the five planned CDs published by Astrum. The project has been supported by the Slovenian government and UNC. He has also done live broadcasts and archival recordings for National Radio Slovenia, Holland Radio, Classical KUSC in Los Angeles, KBAQ in Phoenix, and CPR Classical in Colorado. Gal grew up in a musical family and announced the desire to play cello at age three. When he was eight years old he began studying cello in his native Slovenia. He continued his studies in Croatia, where his appearance in an international competition led to an invitation and a full-tuition scholarship to study at the University of Southern California in Los Angeles. His university studies culminated ten years later with a Doctor of Musical Arts degree. His mentors include Eleonore Schoenfeld, Nathaniel Rosen, Daniel Rothmuller, Peter Marsh, and Dobrila Berković-Magdalenić. He collaborated with and learned from many renowned conductors and soloists, including Sergiu Comissiona, Zubin Mehta, Lionel Friend, Carl St. Clair, Yo-Yo Ma, Lynn Harrel, Midori Goto, Isaac Stern, Joshua Bell, Itzak Perlman, Pavel Vernikov, and Simon Trpčeski.